Approaching the pot (which lies on private land with a small admission fee at the nearby farm) the visitor encounters a notable dry valley which was formed at the end of the Devensian, when the great shaft was frozen up. 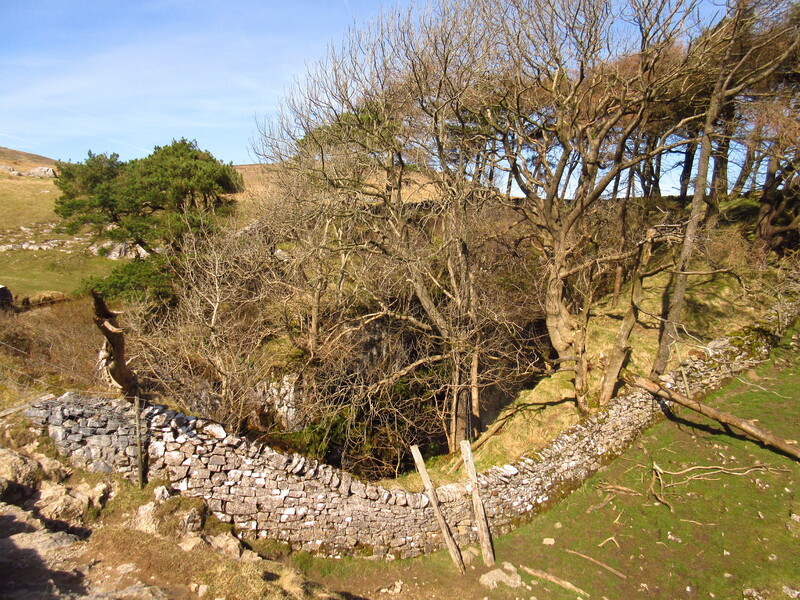 The hole is marked by a conspicuous clump of conifers and surrounded by a limestone wall, though only those with a serious head for heights should cross this boundary – and with the greatest care. The shaft is some 40 metres (120 feet) long by 10 metres (30 feet) wide and at least 65 metres (200 feet) deep to its sloping floor. 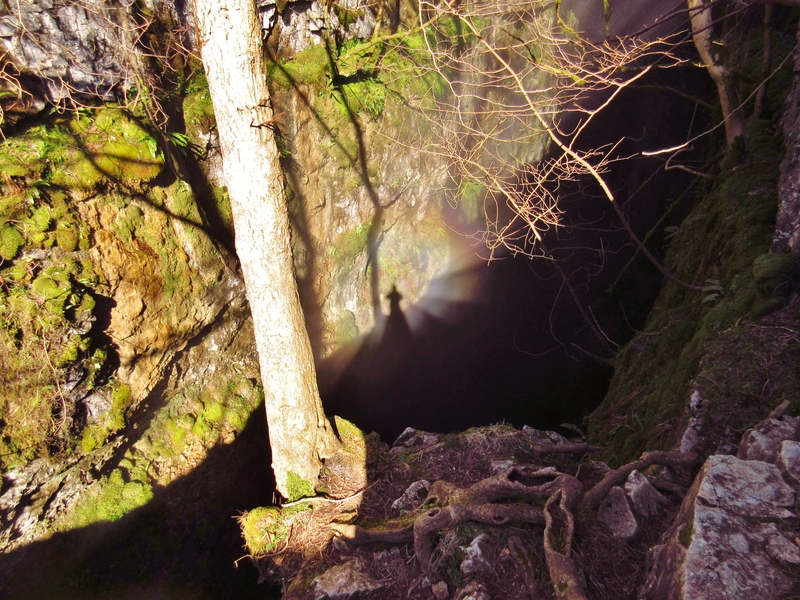 It has been variously called Allen, Hellen, Helln and – very appropriately, ‘Hell’ – and no doubt people of the past regarded it as an entrance to his satanic majesty’s lair. The pot is formed on a fault, or what has been referred to as a ‘master joint’ because, unlike many fault guided shafts, there is no fault breccia (angular rock fragments produced by fracture and grinding during faulting) and no visible displacement of beddings across the shaft. However, though the displacement of the fault may have been comparatively small, it was enough to cause chaos to the hydrology of the local vicinity. The fault is aligned roughly north/south, with a notable dip towards the west. 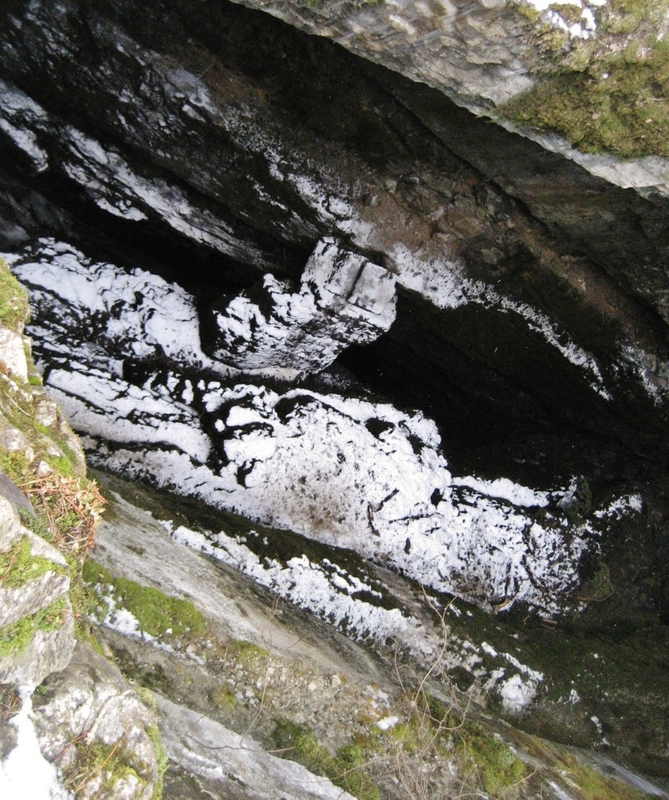 The major caves in this direction, such as the Long Churns and Diccan Pot, are influenced by this gentle dip and run at shallow level beneath bedding planes, occasionally emerging into daylight, before dropping dramatically when reaching the Alum Pot fault itself. 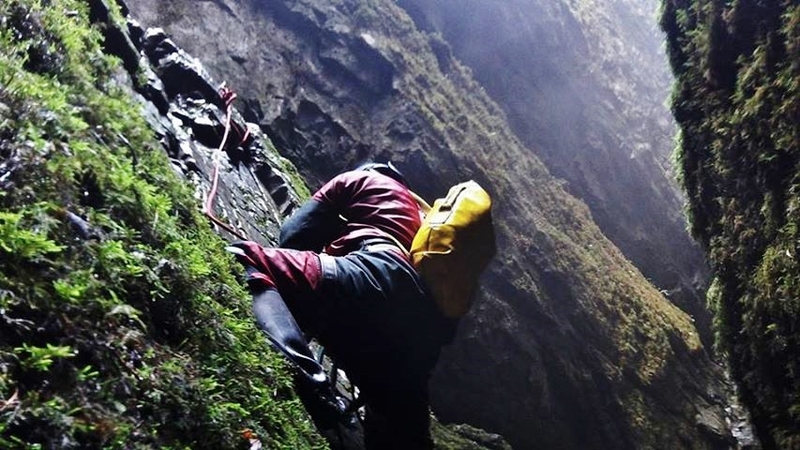 In the case of Diccan Pot, this involves no less than four dramatic underground pitches, including a final 38 metre (150 feet) drop which lands close to the Alum Pot sump. 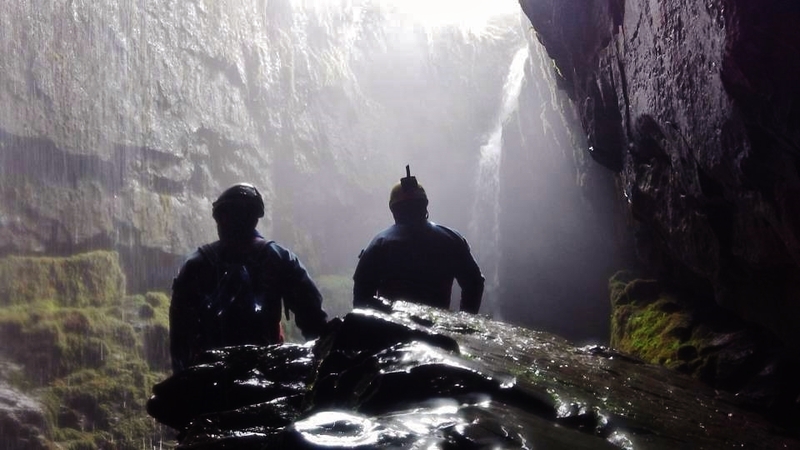 Inside Lower Long Churn, the Dollytubs pitch lands the explorer in a short length of cave passage which emerges half way down the daylight shaft; a truly unforgettable experience. The sight of steam and water droplets caught in the rays of the sun inside this great cauldron is beyond amazing. It doesn’t appear to be of this world. Viewed from the surface, a massive boulder of limestone can be seen leaning across the shaft at an angle of 70 degrees. This notorious ‘Bridge’ is estimated to weigh at least 50 tons – and is usually slid down with the aid of a rope, before the caver makes their final descent to the bottom of the shaft. 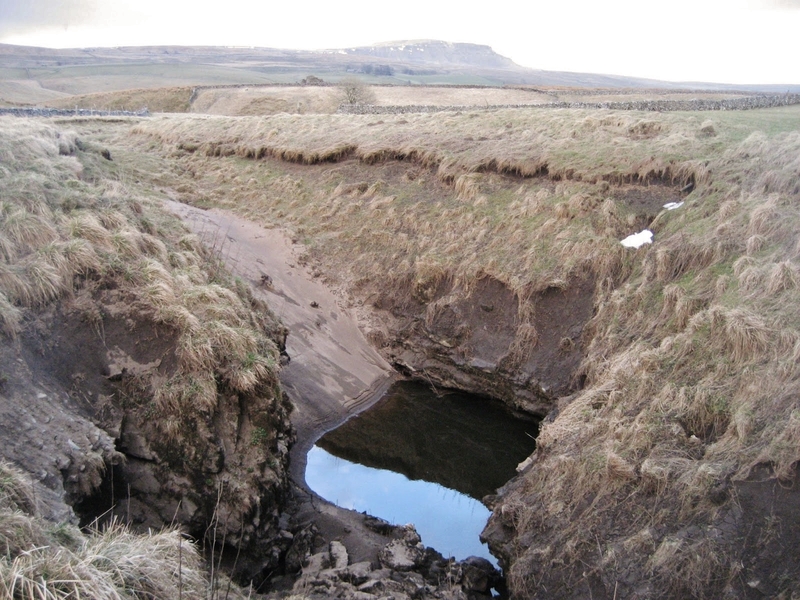 At the south side of the hole, a relatively small stream cascades into the pot, leaving the visitor wondering how such a small amount of water could form such a spectacular feature. 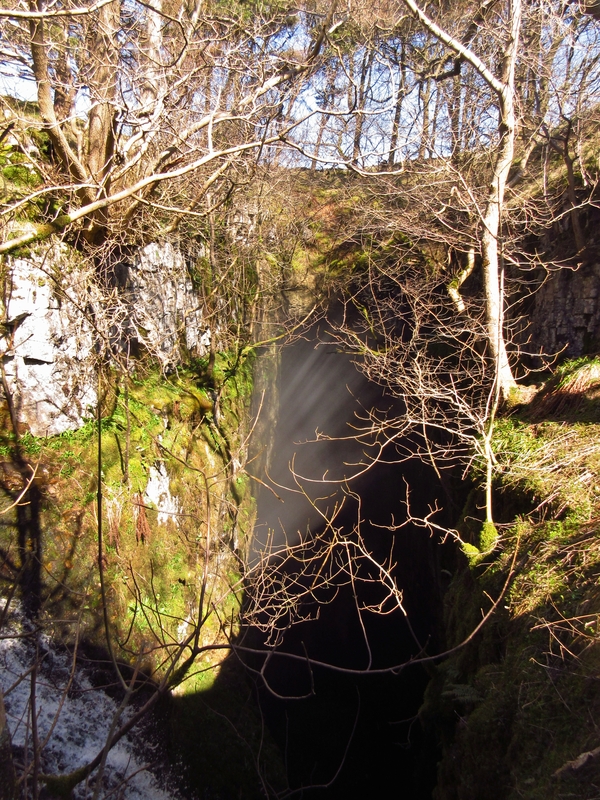 The answer lies in the distant past – perhaps even surpassing the great Anglian glaciation; there will have been no Long Churn Caves to take the water, the Yoredale boundary will have been much closer to the open hole, and a much larger stream will have cascaded into the pot. Add to this the action of meltwater over successive glaciations and the picture of Alum Pot becomes a clearer one. Most fascinating of all is the story of the Alum Pot water. The stream meeting the sump at the bottom of the shaft emerges at the sinister-looking pool of Turn Dub (SD797749), 100 metres lower down and over a mile away to the south-east. Famously, its underground journey is largely a mystery, but what is most remarkable is that the water actually passes underneath the River Ribble itself (flowing on a bed of alluvium on the valley floor), before emerging on the eastern bank at Turn Dub. On its way, there is a window into the system at Footnaw’s Hole (SD791752) – which dries up completely in warm weather. The link through to Turn Dub has not been made by divers, as the passages are choked with boulders and sediment. 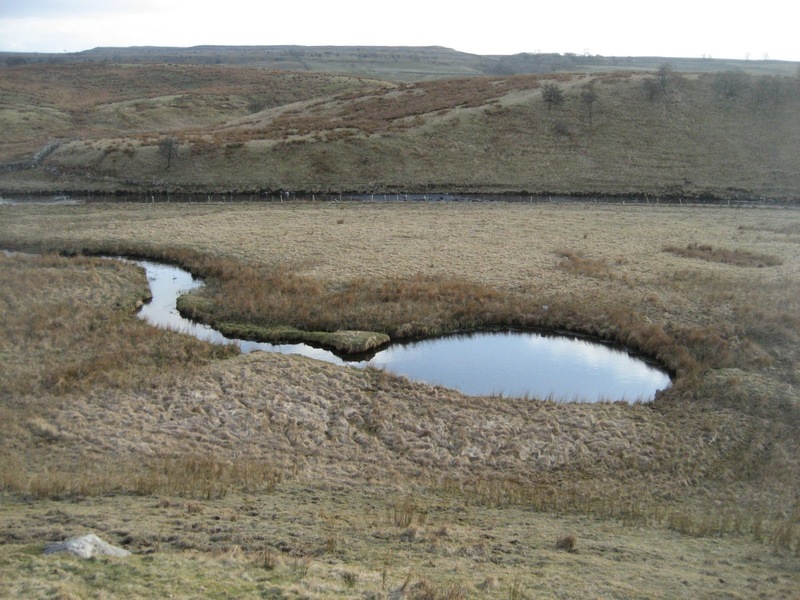 However, with the Footnaw’s window and the Turn Dub rising lying in close proximity on either side of the Ribble, the point at which the water passes beneath the river bed itself can be narrowed down to a small area. 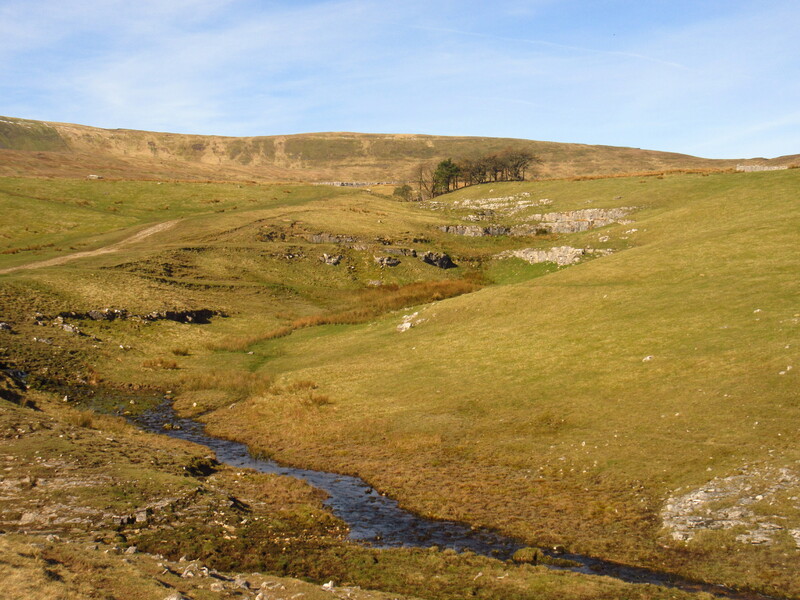 The Alum Pot system remains one of the most dramatic and mysterious features of the Ingleborough karst; a source of endless fascination.